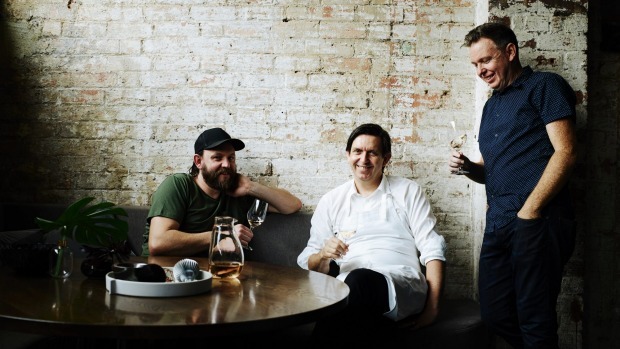 Australia's most famous trio of chef brothers, Andrew, Sean and Matt McConnell, rarely get to cook together, but when they do, magic happens. "Being able to do this Christmas feast was super special for us," says Andrew McConnell. The brothers drew straws on who was going to tackle the turkey course. They claim not to like the festive bird, but the recipe Sean McConnell created for Good Food is likely to woo the most hardened turkey sceptics, not least his brothers. 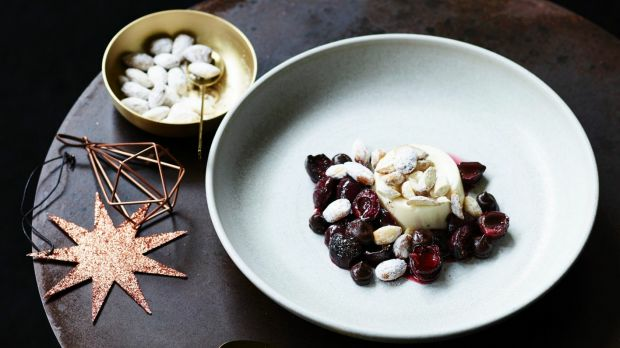 Sean says he'll be working in his restaurant, Monster, in Canberra on Christmas Day, while Matt (Bar Lourinha) and Andrew, from Cutler & Co and Supernormal (among others), will join 24 adults and 12 kids at a giant nosh-up at their parents' house in Kew, Melbourne. "Mum and Dad have got a pretty decent-sized living room and we set up a kids' table outside in the courtyard depending on the weather. 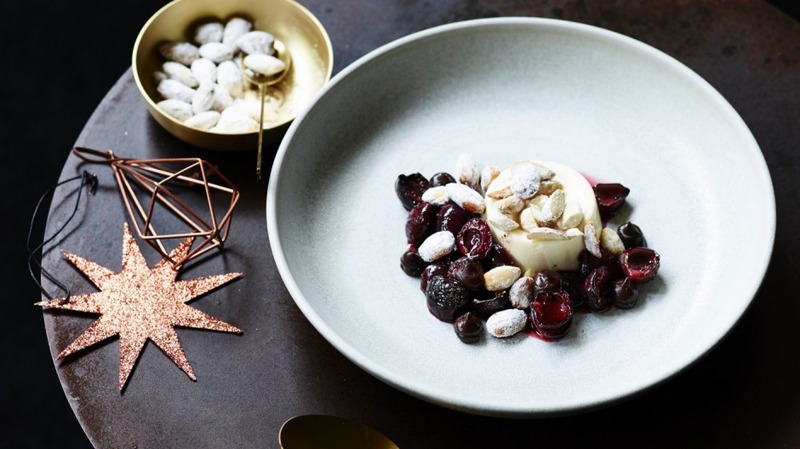 Matt and Andrew usually bring seafood and ham, everyone else brings a few salads, and Aunty Carmel brings her world famous creme caramel," says Sean. "While everyone is faffing about with food, Dad is on booze duty and raids the cellar for a few special bottles he's been hanging onto for a few years. He does a great job at keeping everyone hydrated on Christmas Day." 1. Grate the whole unpeeled tomatoes by placing them on box grater with the eye facing down and press hard. You will make a juicy red pulp, discard the skins. Season with the salt, sugar, cumin and chilli sauce. Add some black pepper and test the seasoning. Blend with a stick blender until medium smooth. Place in the fridge and allow to cool. 2. 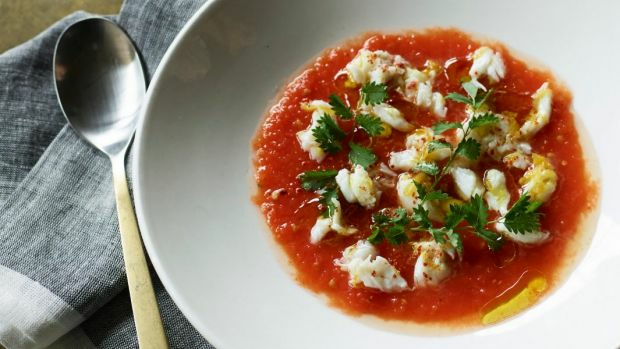 To serve, place chilled tomato in soup bowls and scatter the crab over the top. Grate a little lemon zest on top of each bowl and garnish with the herbs, a few drops of olive oil and a little Aleppo pepper. 1. To prepare the spiced salt, dry roast the and spices over low heat until fragrant. Transfer to a mortar and pestle and grind to a fine powder. Combine the ground spices with the sea salt and set aside. 2. To prepare the turkey, remove the legs and thighs (marylands) and leave the breasts attached to the crown. Place the turkey legs in a shallow dish. Coat generously with two-thirds of the spiced salt. Rub the remaining spiced salt over the turkey breast skin. Cover both and refrigerate overnight. 3. The next day, preheat the oven to 120C. Remove the legs from the fridge and gently rinse off the salt cure. Pat dry and place in an ovenproof dish or saucepan that fits the two legs. Gently warm the duck fat and then pour over the turkey legs until they are completely submerged. Place the legs in the oven and cook for three to 3½ hours or until the leg meat is falling from the bone. When ready, remove from the oven and allow to cool to room temperature. Remove the legs from the duck fat and set aside. 4. While the legs are cooling, cook the turkey crown. Preheat the oven to 220C. Brush the cure from the crown, pat dry and pour over the sesame oil. Place on a wire rack over an oven tray and place in the centre of the oven. After 20 minutes, reduce the oven temperature to 170C and cook for a further 20 minutes or until the thickest part of the turkey breast registers 70C on a thermometer. 5. When the crown is ready, remove from the oven, cover with foil and allow to rest to room temperature. While the turkey crown is resting, shred the meat from the turkey legs and set aside. Remove the breasts from the crown and carve the breast meat into slices 2.5 centimetres thick. 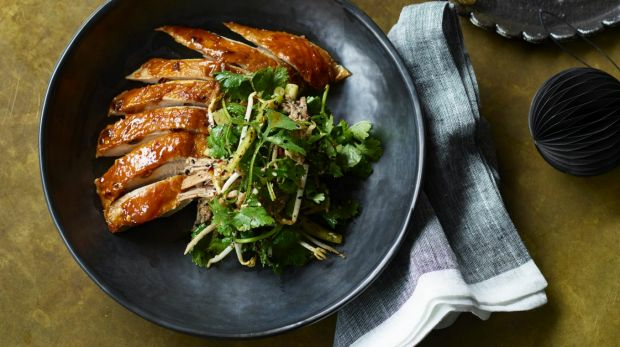 Brush the carved turkey breast with a little of the strange flavour dressing. 6. For the dressing, simply mix all the ingredients together in a small bowl or jug and set aside. 7. For the salad, peel the cucumbers, de-seed and cut into batons five millimetres thick and 10 centimetres long. Toss the cucumber batons with the sea salt and set aside for 10 minutes. After 10 minutes, rinse off the salt and pat dry. Combine the cucumber and the remaining salad ingredients with the turkey leg meat, pour over the dressing and gently toss the salad. 8. Lay the carved turkey breast on a platter, arrange the salad on top and serve. *Chinese sesame paste is a thick paste made from roasted sesame seeds, similar to tahini. It is available in Asian grocers. *Lao Gan Ma (or Godmother) chilli oil is available in Asian groceries. 1. Put the beetroots in a large pot, cover with cold water and season with salt and bring to the boil. Reduce to a simmer and cook until the beetroots have softened. Drain off the water and allow them to cool. 2. When the beetroots are cool enough to handle, peel them by using the back of a knife and trim the tops off. If large, slice into nice bite-size pieces, and marinate with the champagne vinegar for an hour before serving. 3. Smooth the creme fraiche over the base of a serving plate. Arrange the beetroots on top with a little of the excess vinegar. 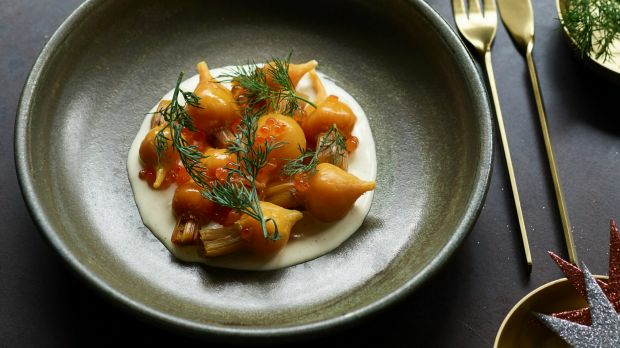 Spoon a nice dollop of roe over the beetroots and garnish with dill leaves and olive oil. 1. Take the mascarpone from the fridge, cover and set aside to come to room temperature. 2. Meanwhile bring the cream, milk, vanilla bean and sugar to a simmer. Soak the gelatine leaf in cold water to bloom, squeeze out the excess water, then add to the hot cream. Whisk well and leave the hot cream to cool to room temperature. When cool, strain and gently fold into the mascarpone. Pour into a single container or six individual bowls. 1. Bring the cream to a simmer and remove from the heat. 2. Add the chocolate to the cream in a medium heatproof bowl and leave to soften. After a few minutes, gently stir the chocolate cream and transfer to a piping bag. Leave at room temperature until ready to serve. 1. Place all the ingredients in a spice blender and grind to a fine powder. Store in an airtight container. 1. Preheat oven to 180C. Line a small baking tray with baking paper. Halve and stone the cherries and arrange, cut side up, on the tray. Sprinkle the raw sugar and spice mix over the cherries and roast for 10 minutes. Reduce the temperature to 150C and cook for a further 10 minutes. Set aside to cool to room temperature. 2. To serve, spoon each set mascarpone cream on to a serving bowl. Arrange the roasted cherries on and around the cream, along with any juice that may have formed. Sprinkle a few candied almonds over the dish and pipe the chocolate sauce on and around the cherries. 1. Preheat oven to 180C. Line a roasting tray with baking paper. 2. Roast the almonds for three minutes, remove from the oven and transfer to a small stainless steel bowl. Drizzle the oil over the almonds, add a pinch of salt, toss well, coating evenly. Sprinkle the icing sugar over the nuts to coat. Return the nuts to the oven and cook for three more minutes. Remove from the oven. When cool, roughly chop the almonds.